Update: Instructions for this bangle are now available for sale. Many years ago I saw a bracelet designed by Miriam Haskell which used leather cord. As soon as I saw it I knew I had to replicate it in beads! Of course I have never been able to find that picture again but the idea of taking one of Miriam's pieces and beading it always appealed. A few months ago whilst browsing jewellery online (both a good and bad habit) I found a photo of a piece from the new “Miriam Haskell Collection” which leapt out at me as being “beadable”. I had no idea what it was made of but assumed diamonds and gold chain which I knew were beyond my price range. Never the less the shape of the piece appealed to be and got me thinking about imitating metal work with beads (something I had just finished on another project) and showing crystals off as though they were set stones. It took a lot of experimenting (and the finished project doesn't really resemble the one I was inspired by or what I aimed to create) but I got there in the end. 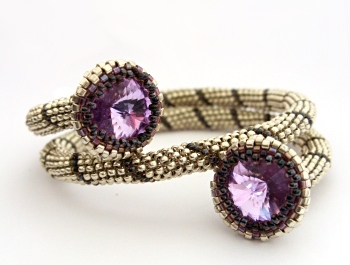 You can see a different colour variation of this bangle here.